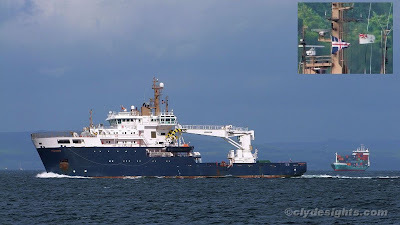 Seen approaching the mouth of the Holy Loch, where she lay overnight on Friday, the Northern Lighthouse Board's tender PHAROS, built in Poland in 2007 was undertaking an inspection of lighthouses on the Clyde. The inset picture shows two flags that were being flown by PHAROS - to starboard the white Commissioners' flag which dates from the Board's foundation in 1786, and does not have the St Patrick flag within the union flag in the upper quadrant, and the NLB pennant seen on the port yardarm. More about these flags can be found here. Another shocker that an "official" boat was built in Poland! Does the govt not believe in supporting its own industry now. Incredible!